Make sure that no objects from the centre console or from other storage compartments can get into the driver's footwell while you are driving. You would not be able to brake, operate the clutch pedal or accelerate - danger of causing an accident! Ash and cigarette or cigar stubs must only be discarded in ashtrays. Two beverage containers can be placed into the recesses A » Fig. 78. One beverage container can be placed into the recess B . Never put hot cups in the cup holder. They may spill as the vehicle moves – there is a risk of scalding. No objects should be placed in the holders that might endanger the vehicle's occupants if the vehicle brakes suddenly or the vehicle is in collision. Do not use any cups or beakers which are made of brittle material (e.g. glass, porcelain). This could lead to injuries in the event of an accident. Do not leave open beverage containers in the cup holder during the journey. There is a risk of spilling e.g. when braking which may cause damage to the electrical components or seat upholstery. Pull the ashtray » Fig. 79 out and up. Never put flammable objects in the ashtray – there is a risk of fire. Do not hold the ashtray by the cover when removing it – there is a risk of it breaking. Press in the button in the cigarette lighter » Fig. 80. Wait until the button pops forward. Remove the cigarette lighter immediately and use. Place the cigarette lighter back into the socket. Take care when using the cigarette lighter! Improper use of the cigarette lighter can cause burns. The cigarette lighter also operates when the ignition is switched off or the ignition key withdrawn. Therefore, when leaving the vehicle, never leave people who are not completely independent, such as children, unattended in the vehicle. These could operate the igniter and burn themselves. 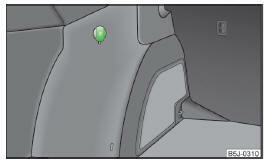 The cigarette lighter socket can also be used as a 12Volt socket for electrical appliances » page 80. Further information » page 127, Services, modifications and technical alterations. 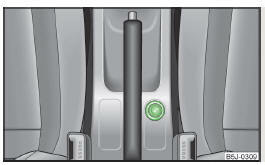 The 12-volt electrical outlet (hereinafter referred to only as a socket) is located in the front center console » Fig. 80 on page 80 and in the luggage compartment » Fig. 81 . Remove the cover from power socket or cigarette lighter, or open the cover for the power socket. Connect the plug for the electrical appliance to the socket. The power socket and any connected appliances can also be operated when the ignition is switched off or the ignition key is withdrawn . Further information page 127, Services, modifications and technical alterations. Improper use of the power sockets and the electrical accessories can cause fires, burns and other serious injuries. Therefore, when leaving the vehicle, never leave people who are not completely independent, such as children, unattended in the vehicle. If the connected electric device becomes too hot, switch it off and disconnect it from the power supply immediately. The power socket can only be used for connecting approved electrical accessories with a total power uptake of up to 120 watt. Never exceed the maximum power consumption, otherwise the vehicle's electrical system can be damaged. Connecting electrical components when the engine is not running will drain the battery of the vehicle – there is a risk of the battery discharging. Only use matching plugs to avoid damaging the power socket. Only use accessories that have been tested for electromagnetic compatibility in accordance with the applicable directives. Switch off the devices connected to the power sockets before you switch the ignition on or off and before starting the engine, to avoid damage from voltage fluctuations. Observe the operating instructions for the connected devices! The clothes hooks are located on the handle of the headliner above each of the rear doors. Ensure that any clothes hanging from the hooks do not impair your vision to the rear. Only use the hooks for hanging light items of clothing and ensure that there are no heavy or sharp-edged objects in the pockets. Do not use clothes hangers for hanging up items of clothing otherwise this may reduce the effectiveness of head airbags. The maximum permissible load of the hooks is 2 kg. The note holder is designed e.g. for attaching car park tickets. 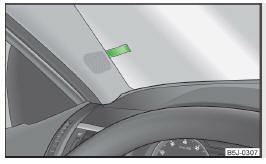 The attached note has to always be removed before starting off in order not to restrict the driver's vision.